Showcase your brand with our new premium quality Paper Board and Set Up Boxes. Great for promotional, gift or retail packaging, our boxes are composed of durable bright white stocks and finishes that are hard to find elsewhere in the packaging industry, and at very competitive prices. 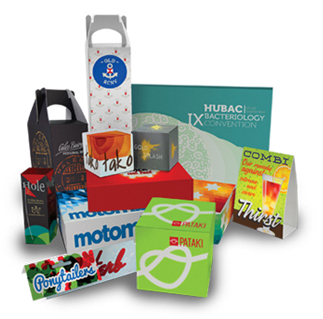 Choose from a variety of shapes, sizes and finishes to fit your box and packaging needs. Why Use Custom Retail Packaging for Your Product? A potential customer’s first impression of your brand comes from the packaging — it’s the first thing they see in the retail aisle. You want to attract their attention and persuade them to buy what you have to offer, and the best way to do that is with custom packaging. Custom boxes with your company’s logo on them brand your products right away. They show potential buyers you care about details. When you use boxes that have been prepared expressly for your products, you put out a strong message about your organizational skills and commitment to investing in your company. In many ways, packaging serves as an on-the-spot brand ambassador for your business. A crisp, well-produced package that fits your product perfectly will show potential buyers you take every aspect of the business seriously. It conveys your appreciation for high quality in everything that you do. It also sets you apart from the competition. Your industry is a competitive one, so you need to convince people to buy your product over others that are similar. One way to do that is to look different from the other things available in your same niche. For instance, if you sell coffee filters, and your competitors all use red packaging for their filters, make yours stand out on the shelf by choosing a blue box. Small details like this will help you attract people to your brand. Your products’ packaging also serves another vital purpose: protection. Whether you’re conducting a product launch or hosting a promotional giveaway, you want your products to be in the best possible shape when people receive them. If they’re broken, chipped or torn, that speaks poorly of your ability to deliver reliable merchandise. Custom packaging is made to your product’s specifications. We size it to complement your product, so there’s no extra space for pieces to bounce around. It’s also an environmentally sound option because custom sizing means no excess waste. Use your box as a canvas to coax people into purchasing your product. You can try creative strategies to gain attention that turn your packaging from necessity to asset. For instance, say you sell cupcakes. You can request a custom box design that looks like an oven, and every time people pop out one of your cupcakes, it seems as though they’re taking it from the oven. That type of creativity will leave a favorable impression on your potential buyers. We assist businesses in Orange County and surrounding areas, such as San Francisco and San Diego, with their custom packaging needs. If you want custom boxes for your product, we have the means to assist you. We can handle high-volume orders and provide fast turnarounds on your packaging. We love helping our clients find the perfect way to package their products to draw attention and increase buyer interest. Get in touch with our Irvine office about your packaging needs. Contact us to receive a quote. Request A Quote Packaging Today!